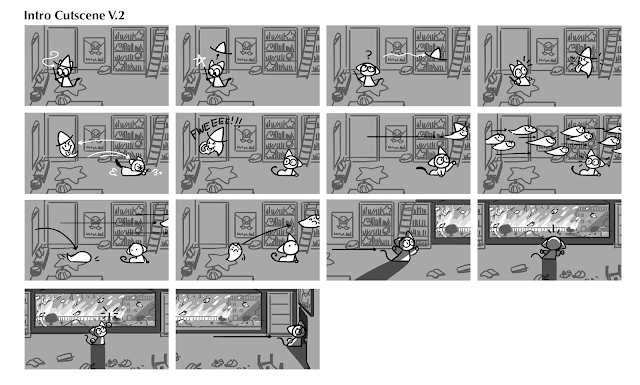 Below are some storyboard variations for the opening and ending cinematics of the 2016 Halloween Google Doodle game! Click on the images to enlarge them. To see more of my concept art and animation work for this game, take a look at this post! The original motivation for the player was to get your stolen hat back and save your school! Finally, we settled on getting your book back (as well as stopping the rampaging ghosts). To save on file size and to be more efficient, I changed the intro to take place in one shot! No more camera panning. We also aimed to place the tutorial within the intro. A "tutorial" backdrop would fall down to indicate you were in tutorial mode! We ended up moving it to right before the first level to not disrupt the flow. Ending, resulting in the final score screen for the players. Black bars would appear so the player would know they were watching a cutscene. 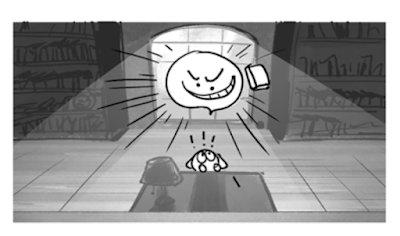 Here's a different story concept: protect the trick-or-treaters!